With more than 57 million repositories, GitHub is the largest source code host in the world and virtually all developers know their way around it. If you use GitHub for version control, making use of its Issues module for bug tracking is a great option. Your developers spend a lot of time in GitHub. Allowing them to track bugs from the same tool can help them be more efficient. And with Instabug’s GitHub integration, they will have issues delivered right to their repository. 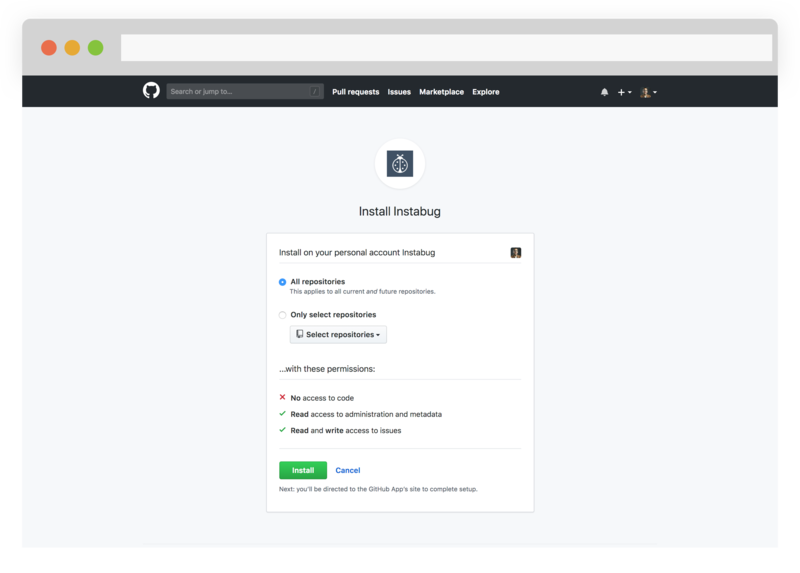 Before we start, let us go through the process of setting up your GitHub integration with Instabug. This is easily done with a few clicks right from your Instabug dashboard. Navigate to the Integrations page from the Settings menu in your Instabug dashboard and click on the GitHub icon. This will take you to the authentication page where you can choose the organization you want to forward to. 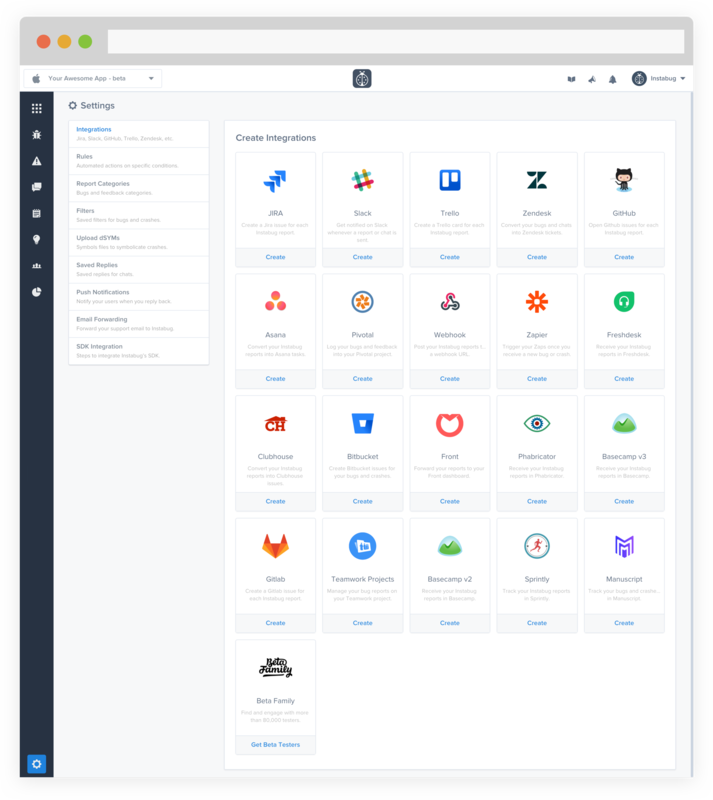 After you’ve chosen your organization, you will be redirected to GitHub where you can choose which repositories Instabug can access and view the permissions granted. Once you click on Install, you will be redirected back to the Instabug dashboard. The next step is to select the repository and assignee the issues will be forwarded to, as well as choose the information that will be included with each report. When you’re ready, click on Continue and we will test the integration by sending a sample bug report. If all goes well, you will land on the last page in the integration process where you can name the integration and enable automatic forwarding for bugs and/or crashes. Pro Tip: You can set up multiple GitHub integrations for the same app, each with their own settings. 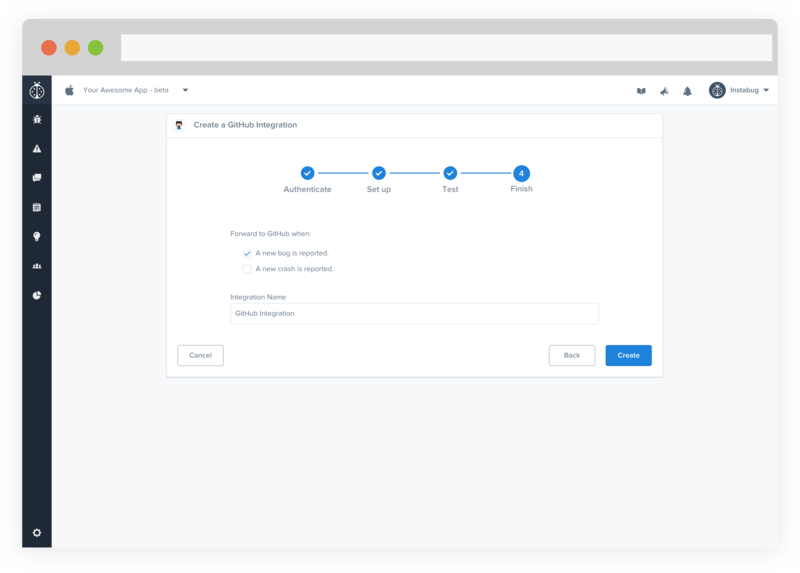 For instance, you can set up a GitHub integration that forwards to your iOS repository and another that forwards to your Android repository, and choose the information that is forwarded to each. Just make sure you give your integrations a good name that will help you recognize them later. An important and sometimes time-consuming part of the bug tracking process is triage. 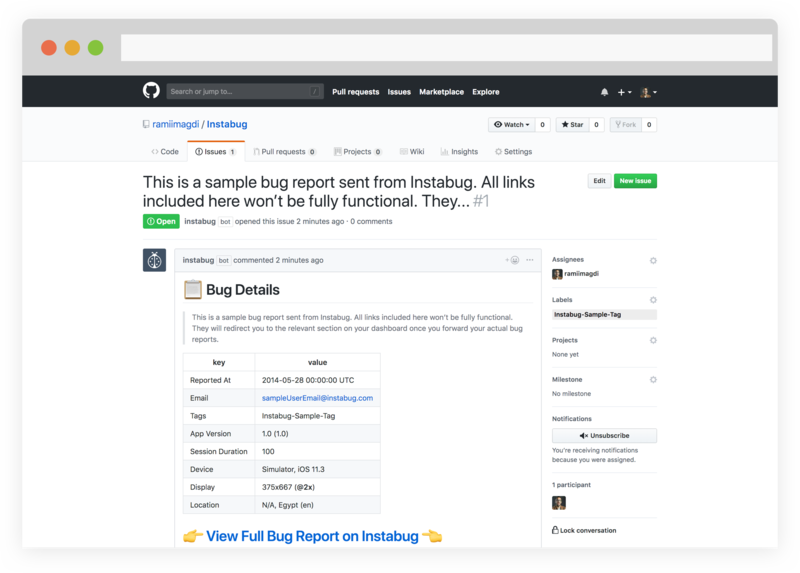 With Instabug’s Report Categories, Tags, and Rules, you can automate a lot of this process. 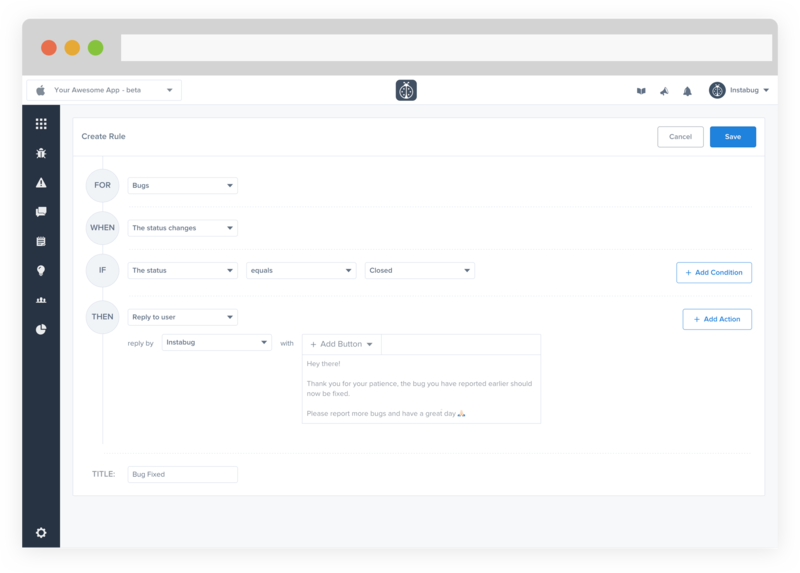 Whether you prefer to triage on Instabug’s dashboard then forward to your GitHub repository for tracking or the other way around, these features will make your life a lot easier. 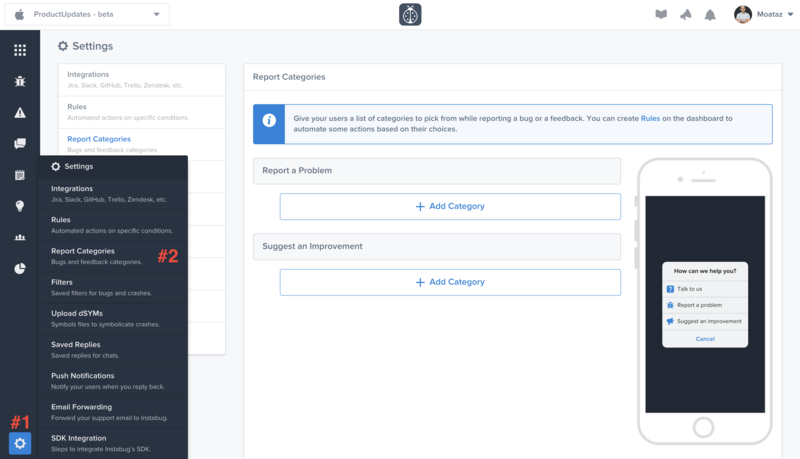 Report Categories let your users choose the category of the issue they are reporting from a list of choices that you define. This makes it easier for you to decide which repository or assignee a bug should be forwarded to. More importantly, you can use them to set rules that will automatically forward bugs to the relevant repository and assignee. Tags can be used to label bug reports so you can quickly decide on the required action. Unlike report categories, tags are added by you or your team, not the end users of your app. Tags can easily be added from the bug’s page by typing them in on the sidebar. Another way to add a tag is to enter #your_tag at the end of the bug report while reporting the bug. Your internal testers can use this way to add tags to bugs they report through Instabug. With all the challenges developers face to find and fix bugs, it is common to forget that your beta testers are a crucial part of the bug fixing process. This is why it is important to show them your appreciation and close the feedback loop with communication. 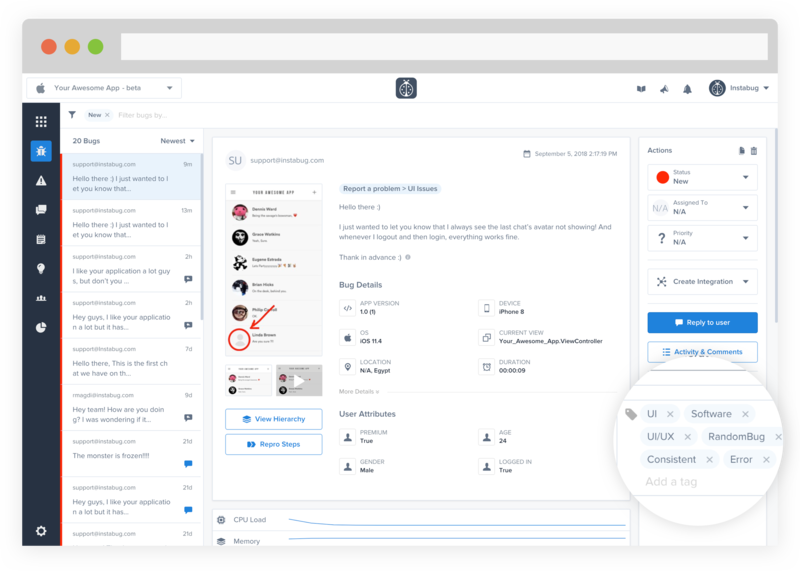 You can set up rules to automatically reply to users with a saved message when they report a bug or when a bug they reported gets fixed. You can also use the conditions to prompt users to update their app if they are reporting from an older version. Replying to reporters is available starting from the Silver Plan.